**This is a slightly dated post that I never published, but I think it still holds up so I went ahead and did it now…let me know if you ever saw this movie! Well, it sure ain’t Star Wars! Star Wars is an entertaining movie franchise that broke new ground when it started, continues to do well due to likable characters, entertaining adventures, clearly defined heroes and villains, and satisfying conclusions. Pretty much everybody likes it. 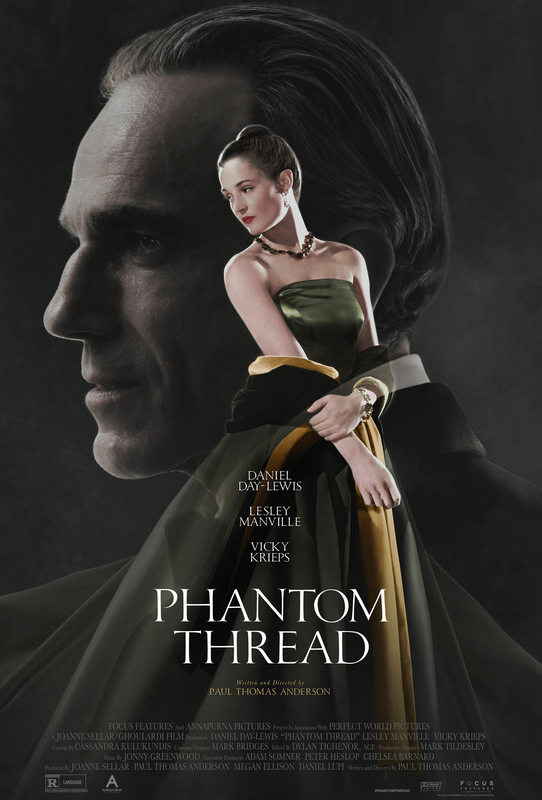 Phantom Thread, on the other hand, is a weird movie about unlikable characters, where actually not much happens, it’s hard to tell the good guys from the bad guys, and the conclusion is just kinda like: Huh. Hmm. Okay..? And I don’t think that many people are gonna like it. I’m talking about regular movie-going people, not professional film critics. Oh listen, the critics are positively SWOONING! They are falling all over themselves to praise the “attention to detail” and the “finely woven narrative” and “another committed performance by Daniel Day-Lewis”. Phooey!! Here’s the deal: this director, Paul Thomas Anderson, positively takes the cake on narcissistic finicky-ness. *bleah* And all that attention to detail? For what? I r-e-e-a-l-l-y don’t like it when you feel like you need to go to Film School to understand a movie. There’s a condescension inherent in that. I love a sophisticated, educated director who has something to say. But this guy! You can positively feel the obsession of the filmmaker and it is stifling. He spends what must have been countless hours poring over the details of place, period, and presentation. But somehow he doesn’t deliver a movie with enough there to match. This is truly style over substance. What saves this movie, and gives it some weight, is of course Daniel Day-Lewis. In this instance the director is one lucky duck. As an actor Day-Lewis is wily, and subtle, and deep. His performance as Mr. Woodcock doesn’t leap from the screen, it oozes and emanates and gradually permeates the entire theater. He’s very skilled and deserves a full, rich script to work on, not this lame doodleybop. The actresses are good too. Vicky Krieps is perfectly cast as Alma, Woodcock’s muse, lover, nemesis, and lion tamer. I have never seen her before, but I can’t imagine anyone else in that part. She has a radiant quality that glows on screen. She portrays Alma as entirely underestimated, and it was curiously heartening for me to see a female character who can give as good she gets. In fact, that element of the movie is really the only satisfying thing! Lesley Manville is so crisp and intelligent as Mr. Woodcock’s tough, clear-eyed sister/business manager that I could watch her all day. For me, she is the true power center of this movie. So I don’t know…if you admire Daniel Day-Lewis this movie is definitely worthwhile, especially since he says he is done with acting. But otherwise be warned: to paraphrase Darth Vader “the Force is not strong with this one”.